I demonstrated this method of making aquamarine in Florence in the year 1602, at the Casino, and I made many batches of it for beadmaking cane, which always resulted in a most beautiful color. After cooling, the beads were removed from the wire, and often strung as rosaries. Using these beads in the recital of prayer dates back at least to the thirteenth century. In 1569, only a few years before Neri's birth, Pope Pius V officially established devotion to the rosary. 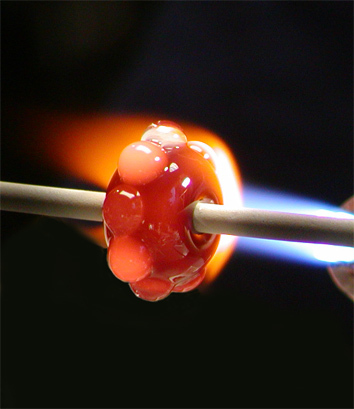 As a priest, the production of glass for beads may have formed a part of Neri's ecclesiastical duties. In chapter 47, he describes a garnet colored glass which is appropriate for small "ferraccia," or pan-fired beads. For these, small lengths of cane were nipped off and pierced with a sharp metal point. A large number of these were then placed in an iron pan, in the furnace, and agitated in order to round them. Neri would supervise the production of beadmaking cane not only in Florence, but also in Pisa. …Mix the powders, and always give them to the glass in six portions, stirring the glass well. Set the interval from one portion to the next by reciting the creed. Assuming he used the creed of Pius IV, adopted at the council of Trent in 1564, recitation takes a little under three minutes. Later in the book, in chapter 117, he uses Psalm 51(Have mercy upon me, oh God...) to time the extraction of kermes dye. 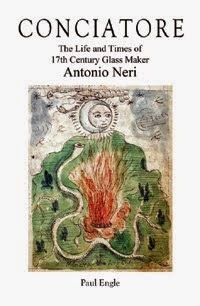 At first blush, it might seem that religion would be at odds with alchemy and glassmaking. In reality, practical elements of Neri's religious life integrate seamlessly with his work at the furnace and in the laboratory.